Audi 80 PDF Workshop and Repair manuals, Wiring Diagrams, Parts Catalogue, Fault codes free download! 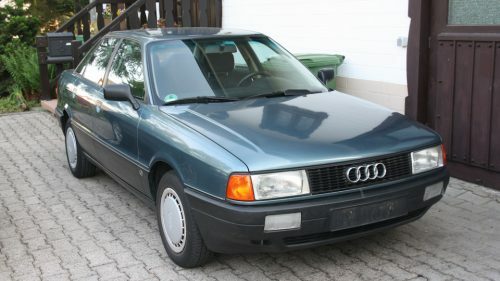 In September 1986, Audi introduced the new generation Audi 80, which since 1987 appeared on the European market. In other markets, the model was presented a year later. The model was based on the new B3 platform (which broke off the Volkswagen B-series platforms without being the same as the Passat B3 platform). The new model had a new aerodynamic shape and a galvanized body. This was the first mid-size car, which had a fully galvanized body, which allowed longer to resist corrosion. This protection proved to be so effective that Audi extended the warranty period from the occurrence of corrosion, the term of which was supposed to be at the level of 8 years at the stage of production preparation, but, in the end, it was increased to 12 years; Audi still continues to use galvanized cases for current models.